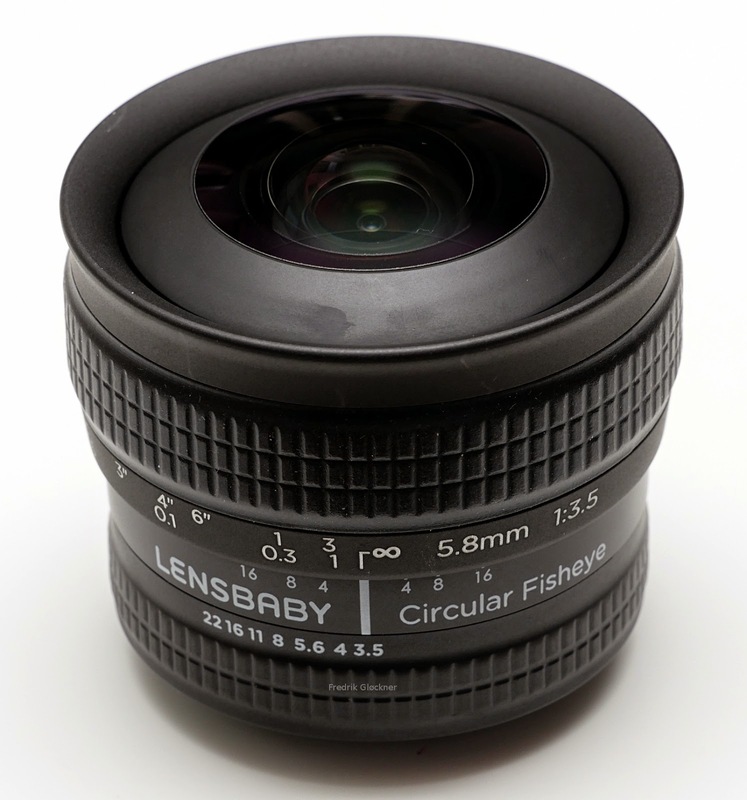 There is a new, expotic, and reasonanbly priced lens available, the Lensbaby 5.8mm f/3.5 circular fisheye. It was announced in April for DSLR mounts like Nikon F and Canon EF. In November, it was further announced in Micro Four Thirds mount and Sony E mount. So, should you buy this lens, and if so, in what mount? That's what I will be trying to answer in this article. Left: Yasuhara Madoka 180 7.3mm f/4 circular fisheye lens. 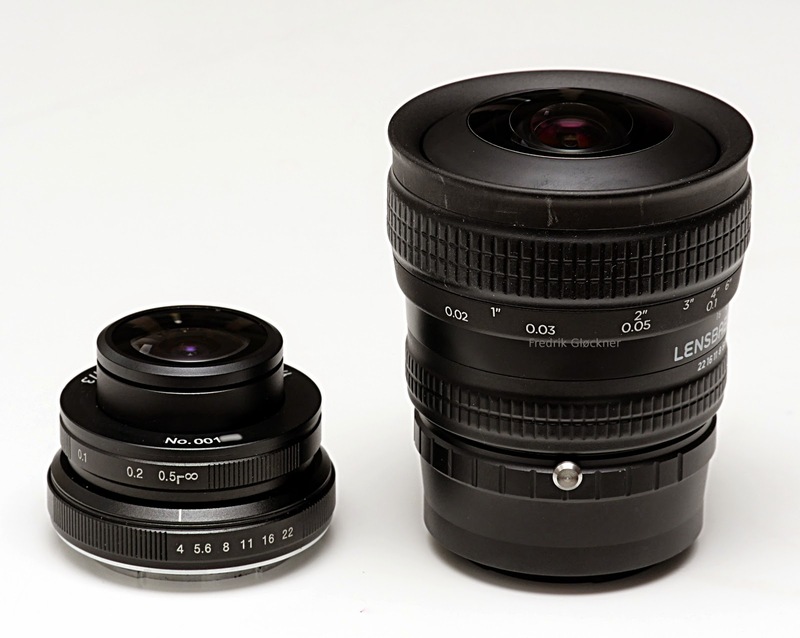 On the right, is the Lensbaby 5.8mm f/3.5 with an adapter for Sony E-mount. The reason why the left lens is so much smaller, is that it is designed for mirrorless from the ground up. The shorter register distance of mirrorless means that wide angle lenses can be constructed simpler. With a long register distance, typically for a DSLR camera, you need a complicated retrofocal optical design to make wide angle lenses. With a shorter distance, the lens design becomes simpler, and you can make smaller, lighter, and less expensive wide angle lenses. 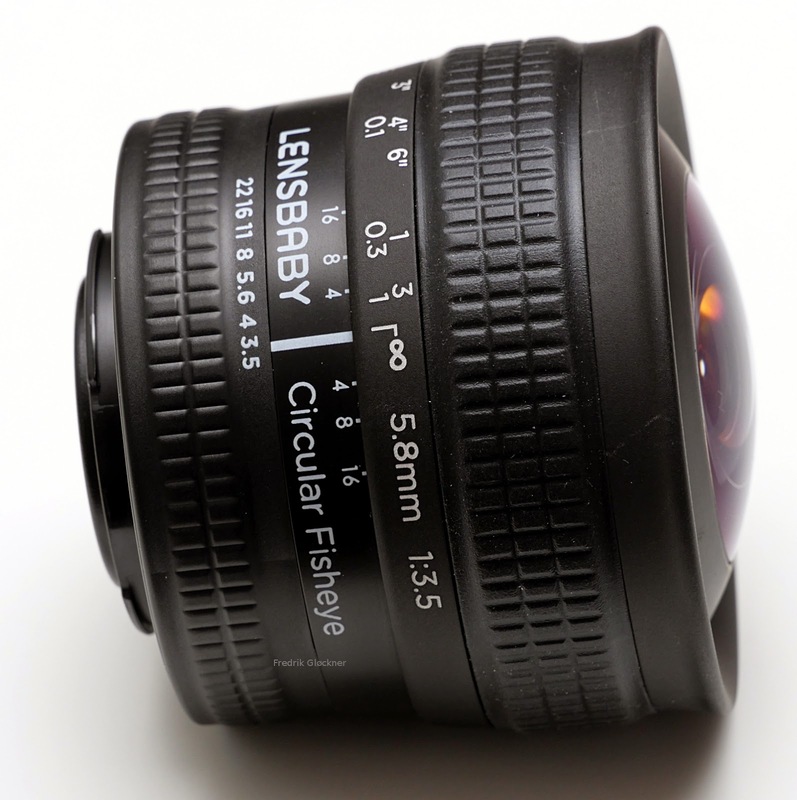 The Lensbaby fisheye lens is available in a number of different mounts. I would recommend to buy it in Nikon F mount. By using a cheap adapter, you can then use it on virtually any system camera, for the ultimate flexibility. There are adapters for, e.g., Canon EF, Micro Four Thirds, Leica M, Sony E, Fujifilm X, Nikon 1, Samsung NX, and many more. You can also buy the lens with a Micro Four Thirds mount, but then you are limited to using it on only M4/3 cameras in the future. So I would rather buy it in Nikon F mount and use an adapter. 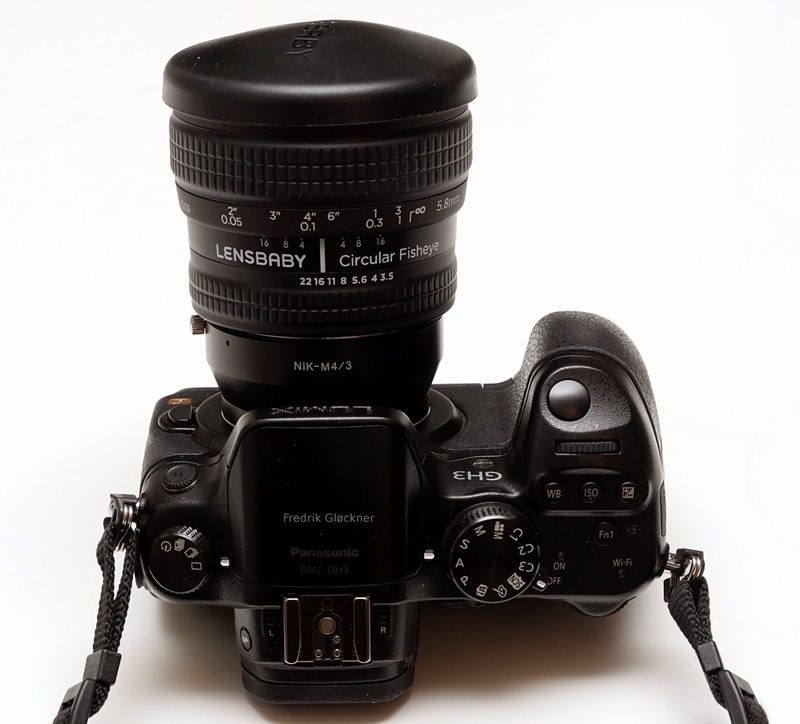 As you can see, the Lensbaby fisheye lens has an image circle diameter of 14.6mm, larger than the heigth of the Four Thirds sensor size, 13mm. Hence, if you use the lens on a Micro Four Thirds camera, you will end up with an incomplete image circle. 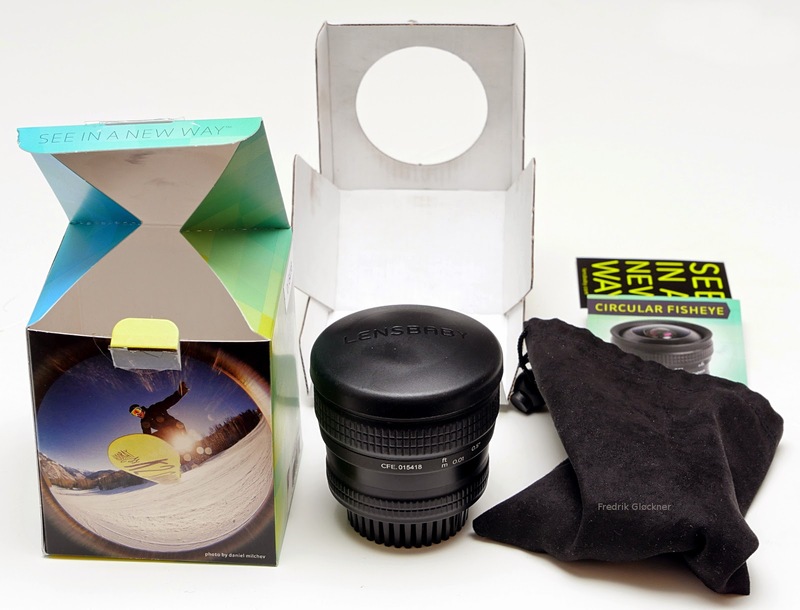 Which defies the point of using a circular fisheye lens. You may still enjoy using it, but it is not a true circular fisheye on a Micro Four Thirds camera. Let's get back to example images later. 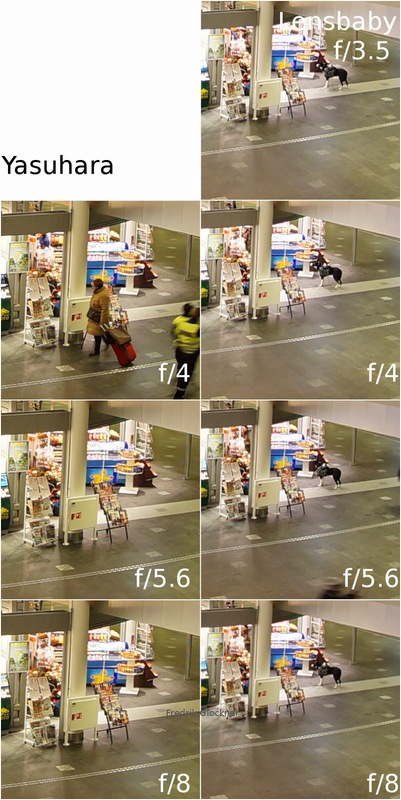 When used on a full frame image sensor, e.g., the Sony A7, you would only use 20% of the image sensor. 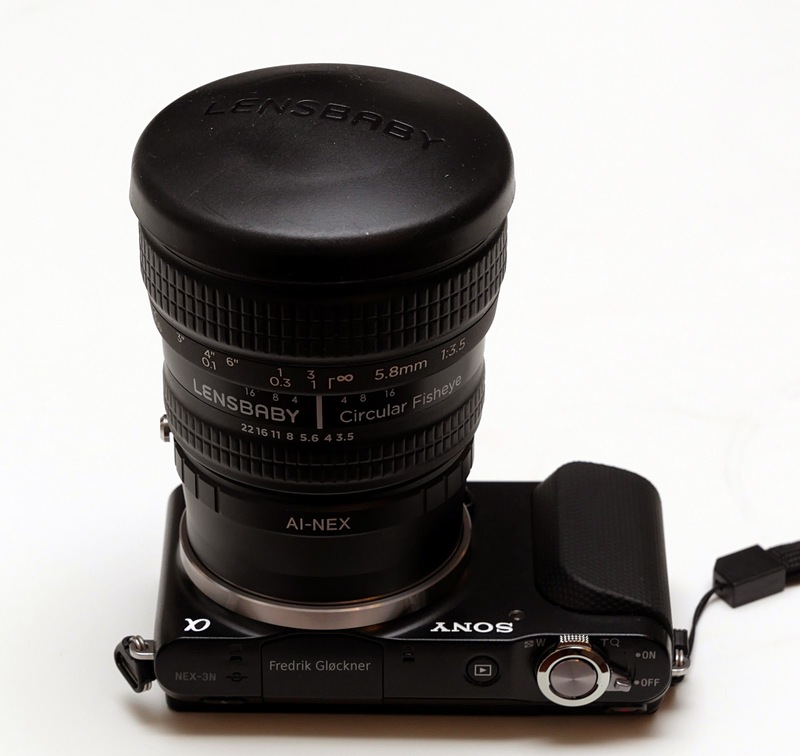 On an APS-C sensor size camer, e.g., the Sony A6000, the Lensbaby fisheye uses about 45% of the image sensor. 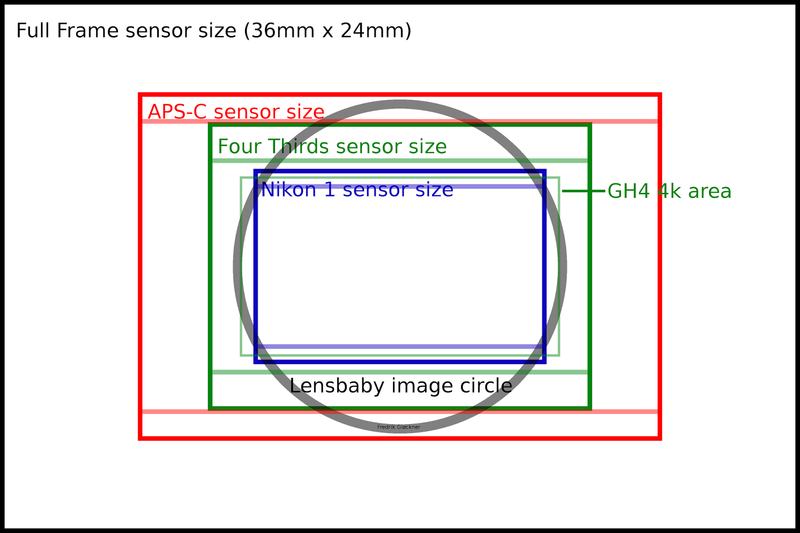 Based on this illustration, you'll see that in 16:9 video mode, the image circle does not cover the entire sensor area even with an APS-C sensor. And with smaller sensors, even more of the image circle is cropped. Using a Nikon 1 camera, the lens covers almost the entire video recording area, and becomes like a full frame fisheye lens. Also note that if you use the Lumix GH4 in 4k video mode, you will almost fill the entire sensor area. You will get some dark corners, though, see examples below. As you see, in the 16:9 video crop, the top and bottom of the image circle are cropped, which is a bit sad. It would have been better if the full circular image had been included. Below, the lens is mounted to a Lumix GH3 (my review) using an inexpensive mount adapter. As you see, there are dark corners with the 4k video crop, as you would expect by looking at the image circle illustration above. I used the original FT-1 adapter to mount the fisheye lens to a Nikon 1 V3 camera, but you could also use an inexpensive third party item. This image was taken to illustrate that the lens image circle diagonal is slightly smaller than that of the one inch sensor sitting in Nikon 1 cameras. With a bit of cropping, you would end up with a full frame fisheye image, which is not too bad. 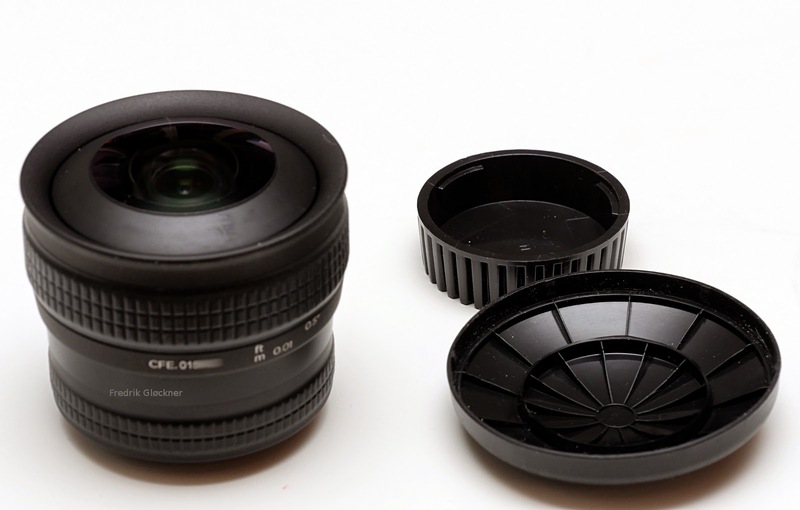 The aperture ring is made from a glossy, slippery plastic material. It is quite difficult to get a good grip on, but it is not a big issue. There are click stops at each full aperture, i.e., f/4, f/5.6, f/8, ..., f/22. The click stops are not very strong, so you can easily set the aperture between them. From the rear end of the lens, we see that the area around the exit pupil is made from a somewhat glossy material, which is unusual. This would normally be a matte material, to avoid reflections. Also, even if this is the Nikon F version of the lens, there is no AIS index notch here at all. So the lens does not support any form of auto aperture handling, you must manually open up the aperture for focusing, and then close it down again when you make your shot. The focus is manual only, of course. The focus ring is made from a slightly rubberized material, and is nice to handle. Operating the focus ring feels nice. It is well dampened, and the travel of the focus ring is just incredible, almost reaching 270° around the lens barrel. On the other hand, the whole focus ring and front of the lens assembly appears to be a bit loose, which doesn't feel very good. When operating the focus, the whole assembly of lens elements move back and forth. That is the traditional way of designing the focus mechanism. 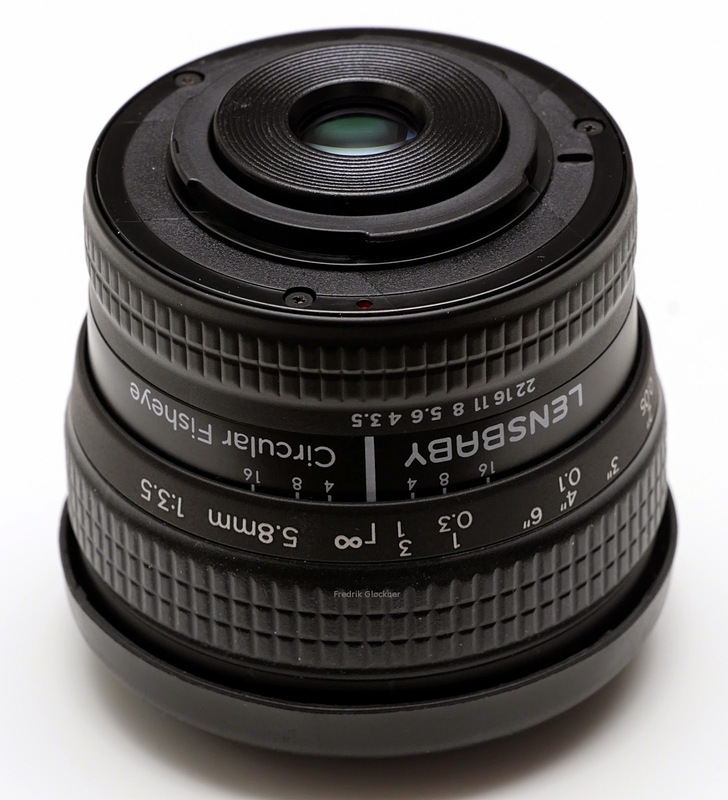 Most mirrorless lenses are internal focus designs, where the front and rear elements remain fixed. The markings on the focus ring appear to be quite accurate, and go all the way down to 1/4'', or 0.01m, meaning that you can focus on objects that are so close that they almost touch the front lens element. In the centre of the image, both lenses are good. No major issues here. In the corner crops, we see that the Lensbaby does have a wider field of view, as advertized (185° vs 180°). However, is this extra wideness really useful when the sharpness is so poor? 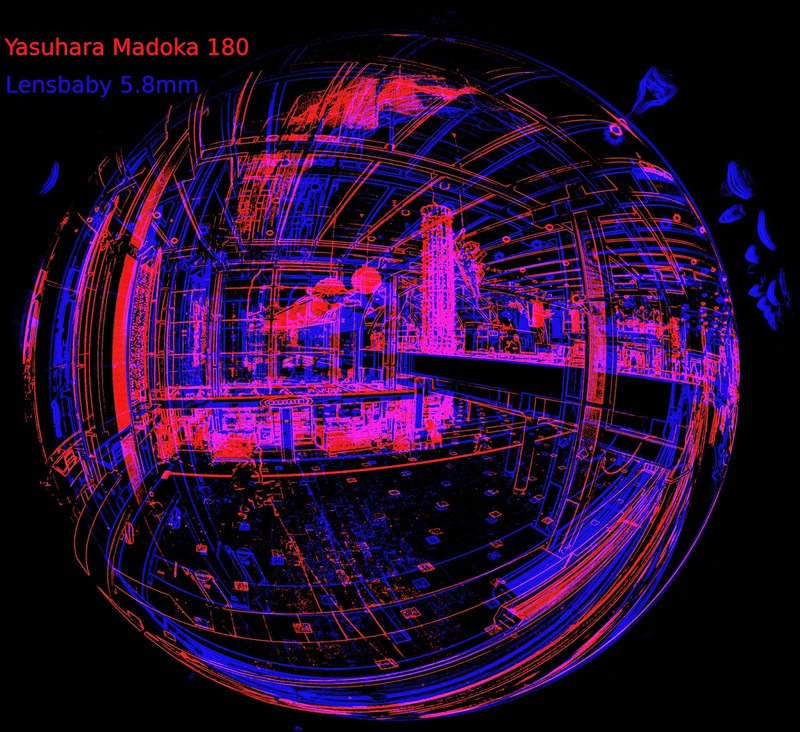 The Yasuhara Madoka 180 is way better. Also, according to the advertisement, the Lensbaby version has a glossy inner barrel, to create "cool" reflections outside of the image circle. And it does work: You get more reflections outside of the image circle. However, this glossy inside may reduce the contrast of the image when you have strong light sources, which is of course not a good thing. Serious manufacturers create lenses with matte surfaces on the inside. All fisheye lenses have serious barrel distortions, of course. That is the whole point of fisheyes. Generally, all straight lines passing through the centre of the image, will remain linear also in the image. The further from the centre they pass, the more bent they will be. However, fisheye lenses can still have different projections, and a different amount of distortions along the edges. Here is an illustration showing the difference in projections. As you see from the image, the Yasuhara lens packs more details in the edge of the image circle. This is not a good thing, it means that you get less details in the edges, and isn't that the whole point of a wide angle lens, to be able to get details from the edges of the image? I'm guessing this difference of projections is due to the longer focal length of the Yasuhara lens: It is 7.3mm, while the Lensbaby has a 5.8mm focal length. 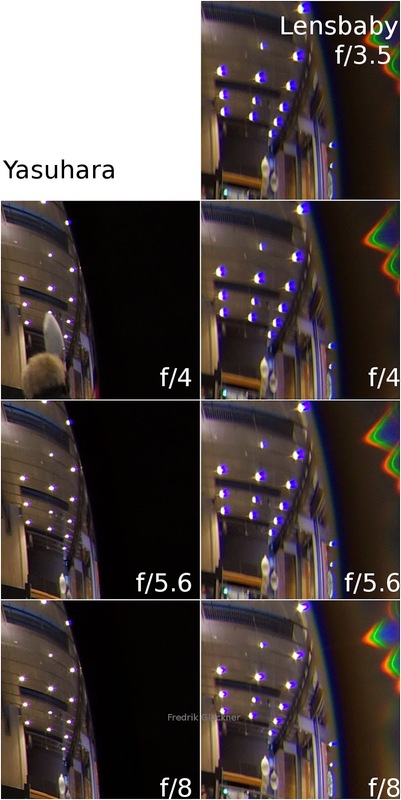 The shorter focal length means relatively less barrel distortion. 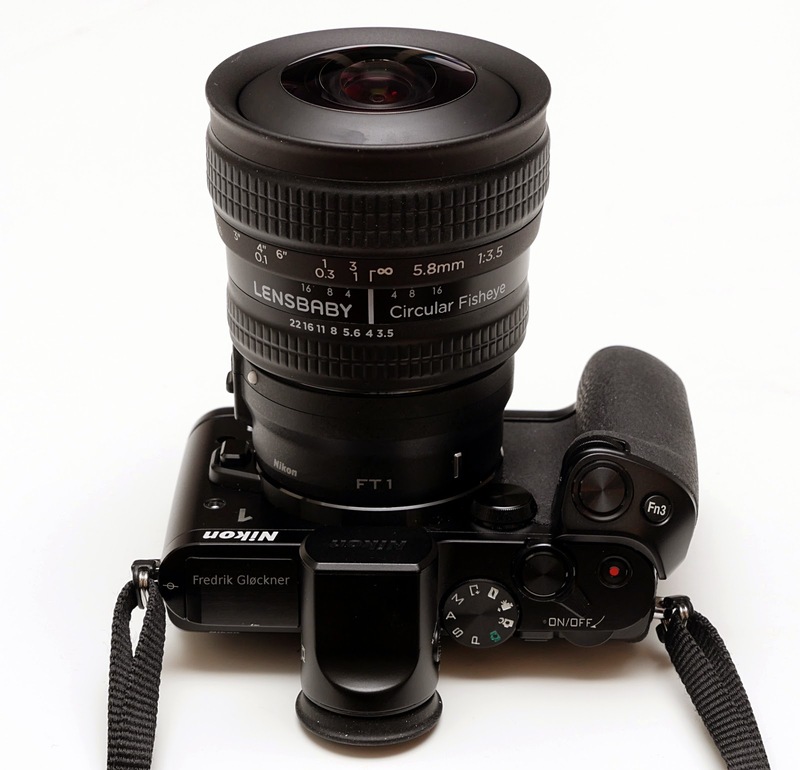 While the Lensbaby 5.8mm f/3.5 circular fisheye looks interesting on paper, the performance is rather poor. It works well in the centre, but the corners are still fairly bad when stopping down to f/8. Also, it has an image circle which is too large for the Four Thirds format, making it useless as a circular fisheye lens on a Micro Four Thirds camera. The Sigma 4.5mm f/2.8 is probably the only proper circular fisheye lens which works well on Four Thirds so far. 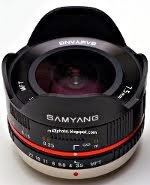 I'm hoping that Samyang will take the bait and come up with a circular fisheye lens for Micro Four Thirds. Their full frame fisheye for Micro Four Thirds is certainly fantastic. On the other hand, the Yasuhara Madoka 180 7.3mm f/4 is true to the mirrorless concept: Very compact and well performing, however, it sadly only exists for the Sony E mount so far. Hello. Do you happen to know what kind of image this lens would produce on a black magic pocket cinema camera? The BMPCC has a sensor quite a bit smaller than Four Thirds. On that camera, the lens is almost like a Full Frame fisheye lens. Do you know what kind of image / cropping would it produce with BM Micro Studio 4K? The sensor size for the BM Micro Studio 4K is slightly smaller than that of the Nikon 1 (2.88x crop factor). So the crop will be slightly narrower than Nikon 1 above, i.e., almost no vignetting.